There are so many different hosting companies available right now that knowing which one is the best for your requirements isn’t easy. ASP.NET programmers want to be certain that they are working with a host that is able to handle the more complex requirements. As you would expect with anything that is developed by Microsoft, ASP.NET works best with a Windows-based hosting solution. However, your usual list of the so called ‘best web hosts’ are not necessarily going to be the right solution for ASP.NET. You want to be sure that you have all of the extra performance requirements taken care off, the database support that you need and not to forget, all priced at the right cost. There are plenty of hosting companies out there that offer really cheap hosting plans, but they are not necessarily going to give you the full package that you need. So it pays to look through the features each host offers and see how it stacks up in terms of what you are getting for your money. If you know it is your top priority to have super fast servers then make sure that your decision is based around that. Also, if you want to work with the latest Windows server then you will find that not all hosts offer that just yet. Basically, what we are saying is we can name the top 10 hosts for ASP.Net but the most important part from your perspective is whether it is the right fit for what you are doing with your website and your main priorities. A2 Hosting – A2 have been hosting ASP.NET for a long time and is probably the best out there right now. Perfect for databases, with loads of storage and SQL support when you need it. Recognized as one of the fastest hosting solutions, you can also upgrade to Turbo servers. GoDaddy – GoDaddy offers a range of Windows plans which they recommend for ASP.NET and they boast ‘industry leading performance and load times’, as well as excellent uptime (99.9%) and expert support. All Windows plans include 200MB MSSQL database storage. 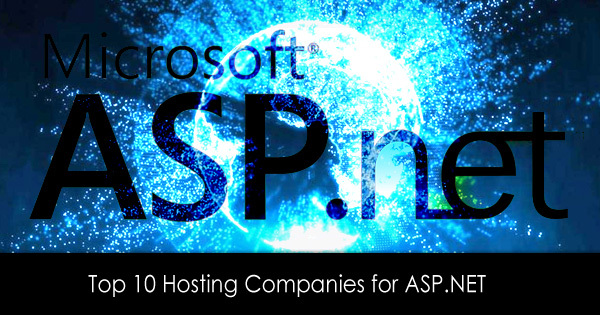 Host4ASP.NET – As you might gather by the name, Host4ASP.NET specialize in this type of hosting. Focusing purely on ASP.NET support, they also provide great performance and are Microsoft recognized. HostGator – Hostgator’s windows hosting support most of the recent versions of ASP.NET. Features include the Parallels Plesk control panel and MySQL, Microsoft SQL and Access Databases. Winhost – The Windows hosting supports a range of ASP.NET versions including ASP.NET 4.7, 4.6x, 4.5.2, 3.5, 2.0 and many others. Provides 2 GB SQL and 2 GB MySQL. Not as much of a recognized company in the industry but good for ASP.NET. 1&1 – 1&1 are one of the hosting companies that always comes out high up in terms of ratings. 1&1 is a reliable host that offers Windows web hosting with Windows Server 2016. The Pro Windows plan starts at £6.99 per month and offers 1 GB of SSD space each for up to 25 MS SQL 2016 databases. DiscountASP.NET – Another hosting company set up specifically for ASP.NET, this host supports ASP.NET Core, ASP.NET 4.6x, ASP.NET 4.5.2, ASP.NET 3.5 and ASP.NET 2.0. In terms of databases, Microsoft SQL 2016/2014/2012 are all included. Lunarpages – ASP.NET is provided with all windows hosting plans and includes the Plesk control panel and Microsoft SQL server. Supporting a range of ASP.NET versions, Lunarpages is another top rated host solution. Hostwinds – Another hosting company that has a good reputation for its long list of hosting plans, Hostwinds also provides Windows servers (2008, 2012 and 2016) to support ASP.NET developers. There is a huge selection of different packages to choose from, depending on your requirements (10 different tiers for unmanaged Windows hosting). Winserve – Winserve specializes in Windows web hosting and works on the latest Microsoft server. You can choose between the Bronze, Silver, Gold and Platinum options to fit to your specific requirements. MySQL and MS SQL server included with all plans and unlimited MS Access databases.